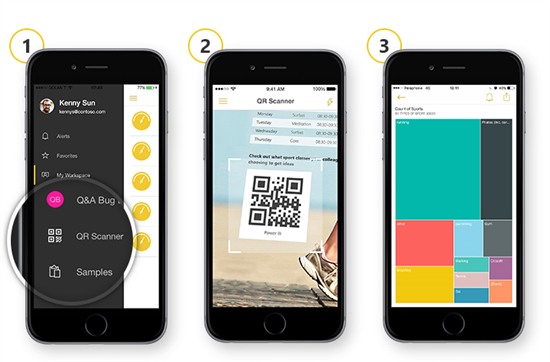 We are thrilled to introduce– QR codes in Power BI. Microsoft Power BI mobile applications aim to bridge the gap between the physical and virtual worlds by leveraging the unique properties of the mobile device, a device that is physically with you everywhere, all the time, always on, has a variety of sensors and is connected to the Internet. The new QR codes in Power BI provide the ability to consume information & insights in the physical environment and context. The car you are selling in your leasing company to get the car’s history. A machine on your factory to get real performance data reflected in a Power BI dashboard. You can easily generate QR codes in the Power BI service for any tile that you have access to. Once generated, you and your colleagues can scan them from your mobile device using the QR code scanner in the Power BI app, or any external scanner, for instant access to the relevant tile. See step-by-step instructions on how to start using QR codes in Power BI. * Currently available on iOS only. Stay tuned for Android support. This is just the first step! Stay tuned for more Power BI mobile features that bridge the gap between the physical world and your business information.